My Turn Quips: Why WordPad? Buried in all Windows operating systems (including XP, Vista, Windows 7 and Windows 8) is a simple, easily forgotten word processor called WordPad. I realize that power users would scoff at the suggestion of using this program; however, it is important to note that not everyone is a power user and not everyone needs the bells and whistles of Microsoft Word. 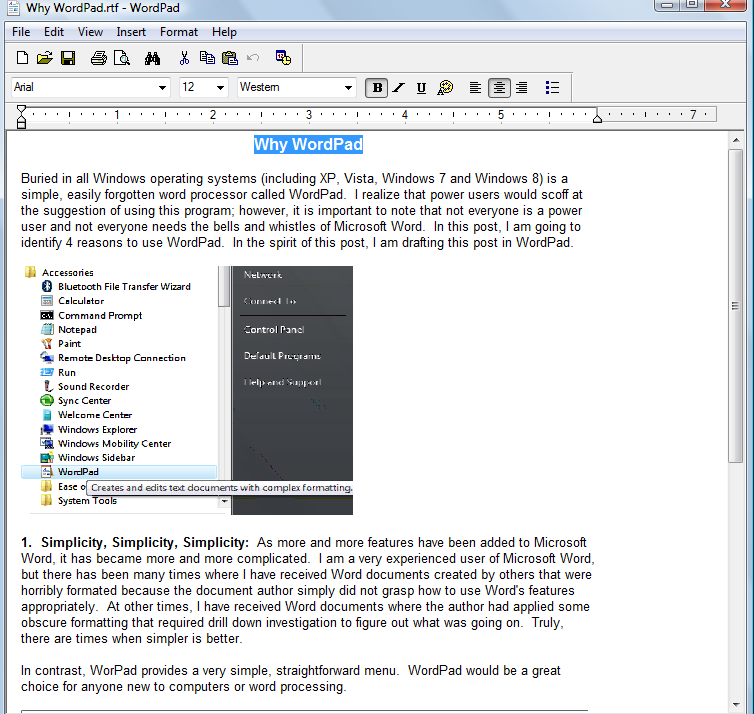 In this post, I am going to identify 4 reasons to use WordPad. In the spirit of this post, I am drafting this post in WordPad and a screen shot of the drafting of this post is provided at the bottom of this post. 1. Simplicity, Simplicity, Simplicity: As more and more features have been added to Microsoft Word, it has became more and more complicated. I am a very experienced user of Microsoft Word, but there has been many times where I have received Word documents created by others that were horribly formatted because the document's author butchered the use of Word's complex array of features. At other times, I have received Word documents where the author had applied some obscure formatting that required drill down investigation to figure out what was going on. Truly, there are times when simpler is better. In contrast, WorPad provides a very simple, straightforward menu and toolbar. WordPad would be a great choice for anyone new to computers or word processing. Choosing fonts, font size, bold, italics, underline, color is simple and straightforward as is features for orienting your text to the left, center or right of the page as well as the ability to create bullets. 2. No Need to Install Software: WordPad is included with your Windows operating system. 3. It's Free: There is no need to purchase additional software. As it is a Microsoft product, you can be assured that it will be compatible with Microsoft Word which is the most widely used commercial word processing program. 4. No Internet Connection Needed: Some may point to Google Docs for free, relatively easy to use word processing. Google Docs are a great tool; however, at the current time an internet connection is a must. I grew up in the country and even today, cable and DSL is not available in that area. There may also be times where you want to records some quick thoughts, but not have wifi available (service issue, traveling, etc). At some point you may outgrow WordPad. For example, one of the features that is sorely missing in WordPad is the ability to easily create tables. If you've outgrown WordPad and you have a reliable internet connection, Google Docs may be your next step - it's free and you won't have to install any additional software. If you do not have a reliable internet connection, you may want to consider downloading and installing the popular, OpenOffice.